In virtually every corner of the globe, women are denied basic human rights, beaten, raped, and killed by men. This happened in the past, it is happening right now, and most probably it will also happen tomorrow. In many regions of the world, longstanding customs put considerable pressure on women to accept abuse. Patriarchal oppression is seen all over the world, where a woman’s sole purpose in life is to serve her father, brothers, and husband for the entirety of her existence. This lifelong cycle of violence is a manifestation of the historically unequal power relations between women and men. Violence against women has a long history in the world, including Bangladesh. The country’s gender inequality have aided in the creation of a male dominated society. This gender inequality and the continuation of a “culture of silence” are the foremost reasons that violence in Bangladesh has persisted. One of Bangladesh’s more extreme evidence of abuse is seen through dowry practices, commonly found throughout the country. Traditionally, dowry customs were an act of love as parents would gift their daughter with a dowry when she entered marriage. These gifts range from money to materialistic things and entitled a woman to be a full member of the husband’s family, allowing her to enter the marital home with her own wealth. It was seen as a substitute for inheritance, offering some security to the wife and was a gift from her family. 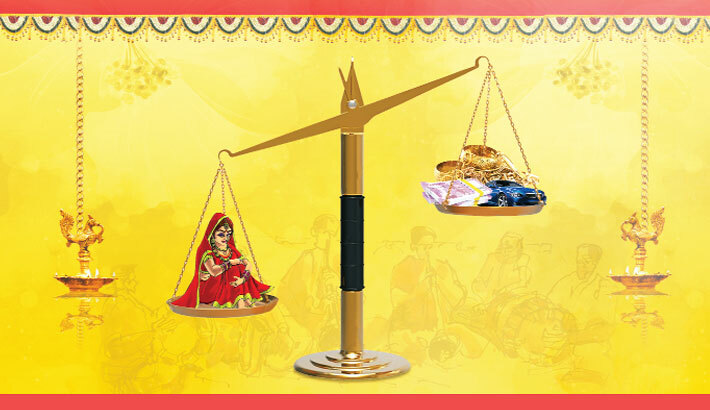 Ultimately, dowry was transformed into a vital source of income for families desperate to meet pressing social needs. Dowry is seen as a dreaded payment on demand that follows the marriage, equating to a family paying a man to wed their daughter, in which the groom works with his family to demand the maximum price for marriage. These dowry demands do not end at the marriage agreement, they can go on for many years. The birth of children often becomes an occasion for the husband’s family to command more money. The inability of the bride’s family to comply often leads to the daughter-in-law being abused, killed, or led to commit suicide to make way for a new financial transaction when the husband remarries. Well, dowry transactions have become a social evil and the families of Bangladeshi grooms make endless demands of the bride’s family. In extreme cases, the newlywed bride can be murdered by her in-laws or even driven to commit suicide. Many victims are burnt to death by being doused with kerosene and set on fire. The husband and his family often claim such incident as an accident. Often, the purpose of such burning is to create another opportunity for the husband to remarry and receive additional dowry payments from his next wife’s family. There are numerous reasons given by husbands and their families to ‘justify’ this inhuman act such as; the woman was not fulfilling her role as a good wife, she did not bring enough dowry during the marriage, she did not produce a male heir…the list goes on. When foul play is suspected, the family claims it was a suicide and the wife could not adjust to family life and subsequently killed herself. The practice continues in Bangladesh even though it became illegal in 1980 under the Anti-Dowry Prohibition Act. But despite being illegal for decades, dowry transactions are becoming more uncontrolled and practiced. Different factors drive families in Bangladesh and elsewhere to marry off their girls at a young age, among them poverty, illiteracy, cultural or societal pressures are noteworthy. Moreover it is also true that younger brides require smaller dowries. The anti-dowry laws in Bangladesh punish both families, so burdens are placed on the women for fear of her family receiving punishment for seeking protection. Society turns a blind eye to cases of violence against women. More than 40 percent of women in Bangladesh have experienced physical violence by their intimate partners, according to the Asian Development Bank. Domestic violence against women and girls is an everyday occurrence in Bangladesh. However, as per press reports published on March 9, 2018, a rural youth has turned into a game changer. He has set a shining example by returning dowry money that his parents took from his mother-in-laws during his marriage four years ago. The youth, Ershad Ali, 26, works as a helper at a grocery store in Jaldhaka upazila town under Nilphamari while his father Atiur Rahman, 60, is a rickshaw puller. The story goes like this - with his little earnings, Ershad used to lead a simple life along with his wife and toddler daughter. Yet, from everyday earning, he set aside a portion for an unknown reason. Four years ago, Ershad’s father, an inhabitant of Sabujpara in Jaldhaka, arranged his marriage with Rozina Begum and demanded a dowry of Tk 1.5 lakh. Rozina's widowed mother Rabeya Begum, 50, bargained and reduced the amount to Tk 90,000 while she took a loan from an NGO to pay the amount. Ever since, Ershad has seen his mother-in-law toiling as a domestic help to pay the loan installments. “Even when she was ill, she sometimes worked till midnight,” he said. “She never complained and insisted on bearing all the medical expenses herself when my daughter was born in 2016, despite my objection.” It gnawed on Ershad that he had done injustice towards Rabeya by taking the dowry. In the meantime, he observed the anti-dowry campaigns of the government and listened to the khutbah (Islamic sermon) before the Friday prayers at the local mosque that condemned the practice of paying dowry. “I could not believe it when Ershad came in the morning with my daughter and grandchild to my house. Now I can leave work and make a living by selling the milk, and pay off the loan as well,” she added. “I am very lucky as the Almighty blessed me with such a good son-in-law,” Rabeya said in a choked voice. The story of Ershad's noble act quickly spread all over. Rashedul Huq Prodhan, upazila nirbahi officer (UNO) of Jaldhaka, said, “I hope this selfless act will inspire others in the locality to abolish the practice of dowry. Ershad has set an example for all.” In the end it is mentionable that if youths, especially rural youths, emulate the example of Ershad Ali, then the curse of dowry will be eliminated once for all from the society.